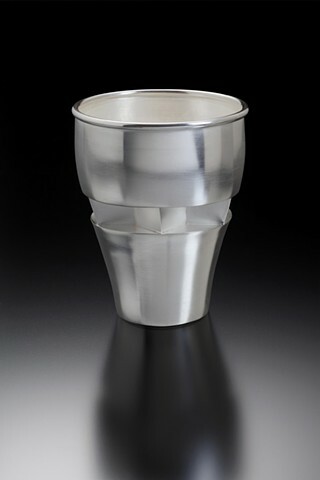 This Kiddush cup has been 20 years in the making - raised in undergrad, technical issues resolved 20 years later using a Fred Fenster inspired design. I had the honor of working with Fred Fenster for four years at the University of Wisconsin-Madison. I learned so much from Fred both about metalsmithing and about life. I will be forever indebted and grateful to Fred for more than I can say. Using the technical and design skills Fred taught me, I managed to salvage this cup by removing the thin spots and soldering in a fabricated, tapered Star-of-David insert. I hope he would be proud. L'chaim - to Fred and keeping traditions alive.